Nations Press feature news Arrogant Doctor Mistreating A Motorists that she Bumped on The Road for requesting X-Ray Lab.! Arrogant Doctor Mistreating A Motorists that she Bumped on The Road for requesting X-Ray Lab.! SPONSORED LINKS A lady doctor driving a Honda CRV allegedly hit a motorcycle and refused to give rider x-ray after repeated request. A doctor was so mad in this video that she got almost everybody who views the video really upset. She was close to cursing the poor lad who only wanted to have an X-ray since he figured in an accident! 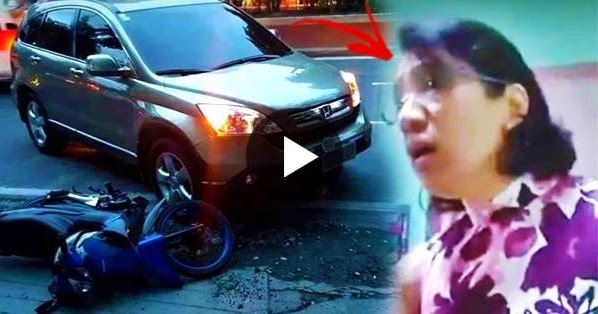 The video was apparently taken by the companion of the victim, who, ironically was hit by the lady doctor who was driving a wee bit recklessly.The doctor said that since the guy was walking, then he no longer needs an X-ray. The lad kept on insisting that he feels some pain on his body, which is why he wanted an X-ray, which the doctor apparently refused. Aside from this, the doctor also compared her past motorcycle accident to that experienced by the teenager. She said that when she had an accident, her whole body was painful, whereas with the boy, it’s just normal to have some bruises, and at that point, she said that there really is no need for an X-ray. According to the doctor, considering that the teenager can raise his arm, then it means that he is okay, and that there’s no broken bone.Although this may be a valid contention and under the circumstances, people rely on movement to determine whether there is a broken bone or not, the fact that he figured in a vehicular accident would necessitate an X-ray. The now hysterical lady doctor said that the teenager was so “kulit (persistent),” and that since she is the doctor, she would have to be followed.